Internet To Income Seminar – footsteps…….. I attended a seminar recently and learn that Financial Freedom means Passive Income is more than Expenditure. Passive Income can be generated from Investments, Business and from the Internet. The easiest and hassle free is from Internet Marketing since you just need a a laptop or PC and an internet connection. With just a few understanding on how it works, one can already start own a passive income anytime and anywhere. There will be one 2 Day Seminar to Learn about How To Make Money by Affiliate Marketing. 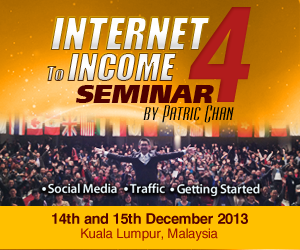 This seminar will be managed by one of Malaysian successful Internet Marketer, Patric Chan and to be held in Kuala Lumpur. I have registered myself since the fee is affordable and I was on of the early bird. Next Post What Is Your Cup Of Coffee?